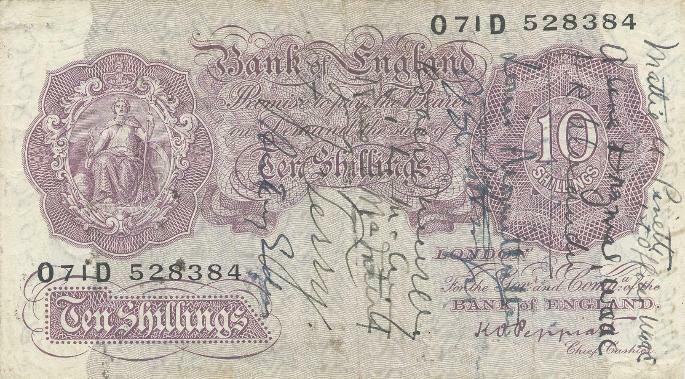 Although the idea of a banknote with graffiti all over it makes me cringe, some are interesting in the content of the writing (providing the note isn't rare!). Short snorters fit that category and are an interesting phenomenon, with a significant historical tale. 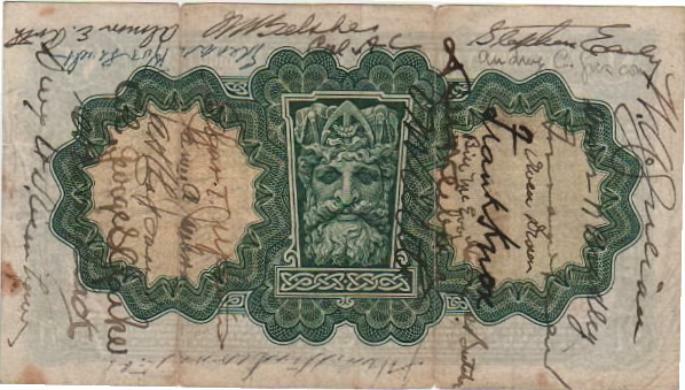 A short snorter is a banknote which was signed by various persons traveling together or meeting up at different events and records who was met. The tradition was started by bush pilots in Alaska in the 1920's and subsequently spread through the growth of military and commercial aviation. If you signed a short snorter and that person could not produce it upon request, they owed you a dollar or a drink (a “short snort”, aviation and alcohol do not mix!). From shortsnorter.org. More on Short snorters there. This is the Ledo Road Short snorter, commemorating the Ledo Road construction project during World War two. It is signed by a lot of senior people of the time, including Louis Mountbatten. The Ledo Road, from Ledo, Arunachal Pradesh, India to Kunming, Yunnan, China, was built during World War II so that the Western Allies could supply the Chinese as an alternative to the Burma Road which had been cut by the Japanese in 1942. 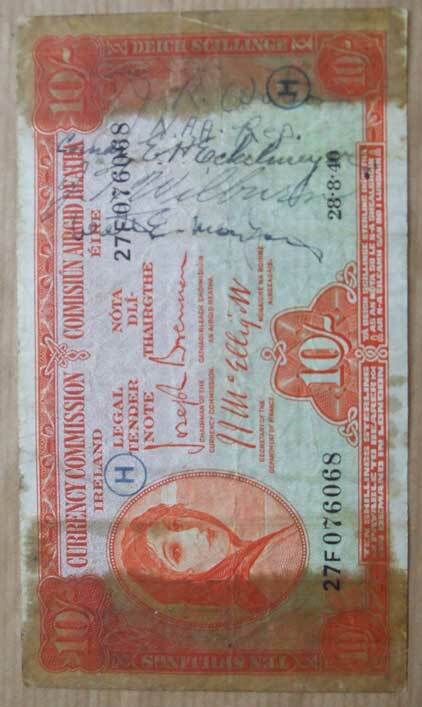 Here is a Short Snorter on an Irish Lavery Ten Shilling note. 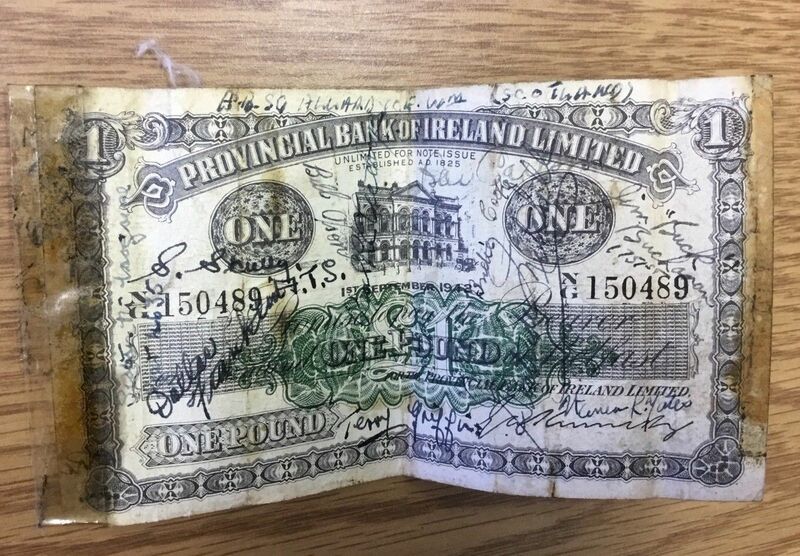 The instances of Irish notes being used in such a fashion reflects the fact that during WW2 US aircrew used to pop down to the Republic of Ireland for some R 'n' R from bases in Northern Ireland. This resulted in some 10/- and £1 snorters. I've note seen any higher denominations. I've been doing a bit of research, and there are several Short Snorters linked to some of the more famous meetings during WW2. This one is signed by both Churchill and FDR amongst others. A nice piece of history. It links the London Conference (July, 1942) and the Cassablanca Conference (January 1943). A detailed report on the note, with a listing of the signatories is here on the short snorter website. Cassablanca Conference, January 1943. Again signed by Churchill and FDR. A detailed report on the note, with a listing of the signatories is here on shortsnorter.org. Although missing the signatures of the leaders, this is still an interesting part of the set. 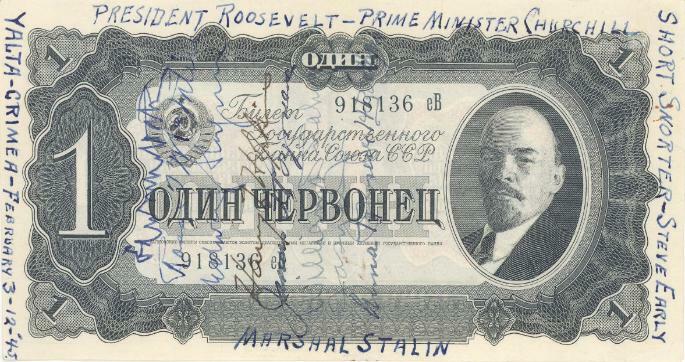 More about the Yalta short snorter. 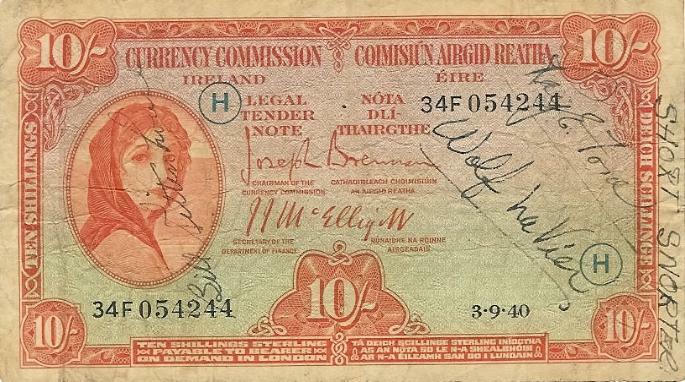 Here is an Irish Lavery Pound note Short Snorter, dated 1939 (this note would have entered circulation in mid-1940) which includes the signature of Dwight D. Eisenhower, and some other important people of the time. 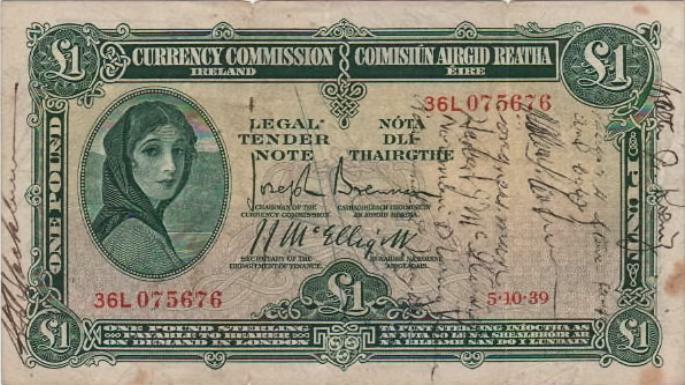 One wonders how these signatures ended up on an Irish note. 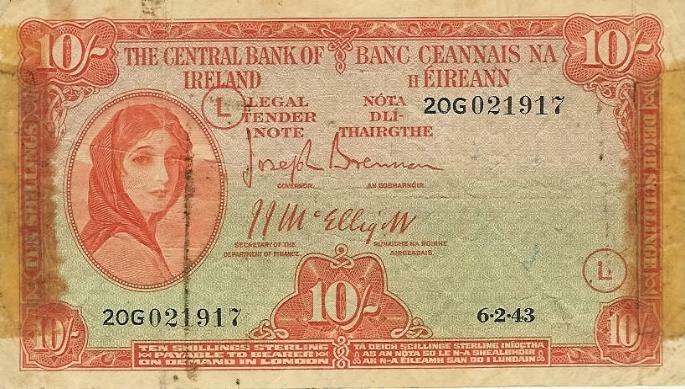 These notes are known to have been in circulation in Northern Ireland, tough not in large quantities. 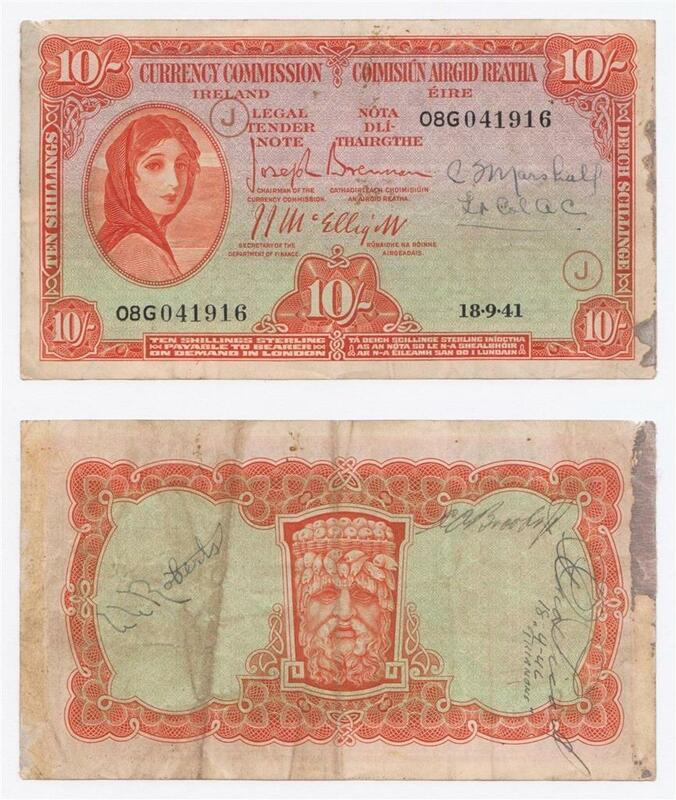 Here's another Lavery 1940 10 shilling note Short Snorter, presumably wartime. Not sure what the names are though. 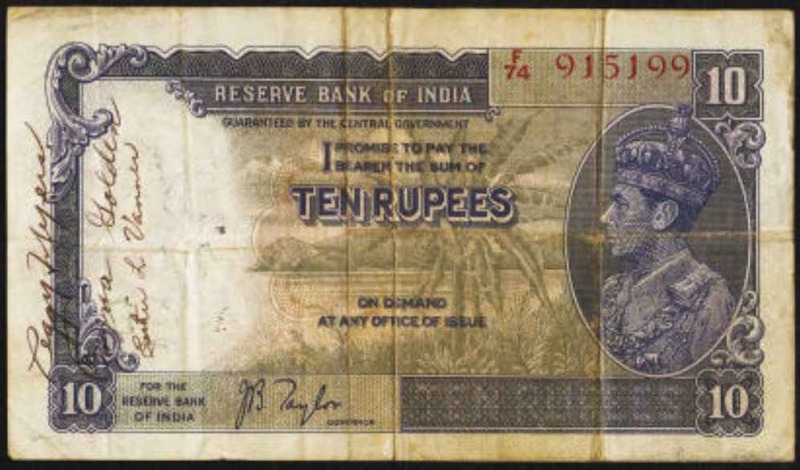 1941 10 Shilling note short snorter. 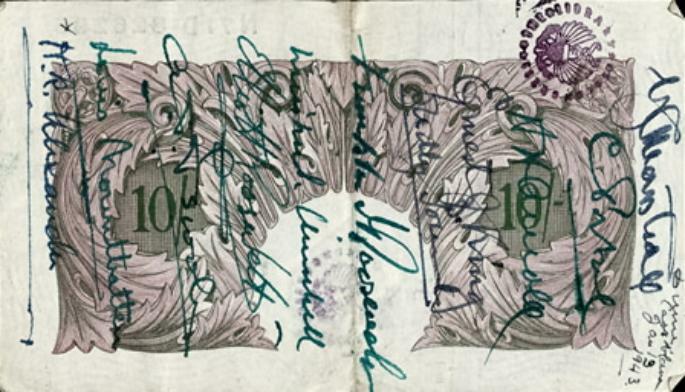 One of the signatures appears to be dated 18.4.46. 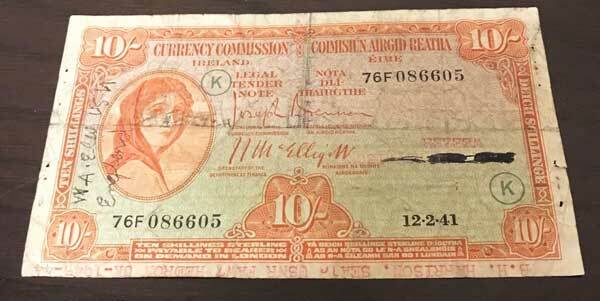 USNR short snorter on a 1941 Irish 10 shilling note. This one is from 1943. Looks like it was circulating in England I guess. 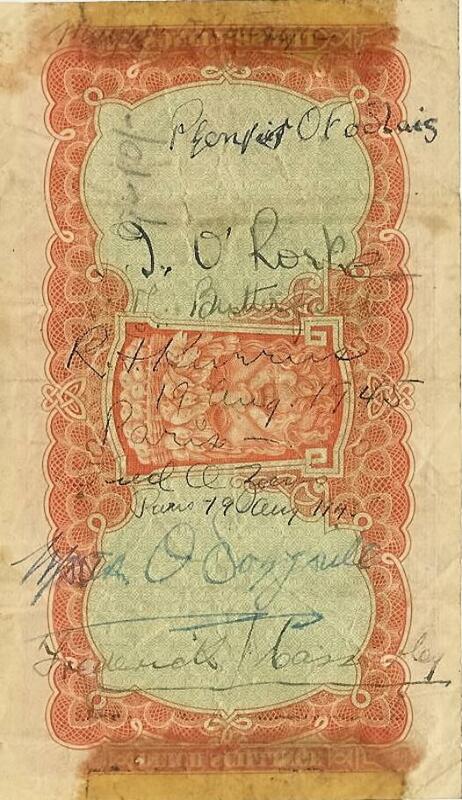 Interesting to see a note dated 1941 with evidence of withdrawal from circulation (the date stamp) in 1943-44. I don't know of any place called 'Hedron' in the UK though. 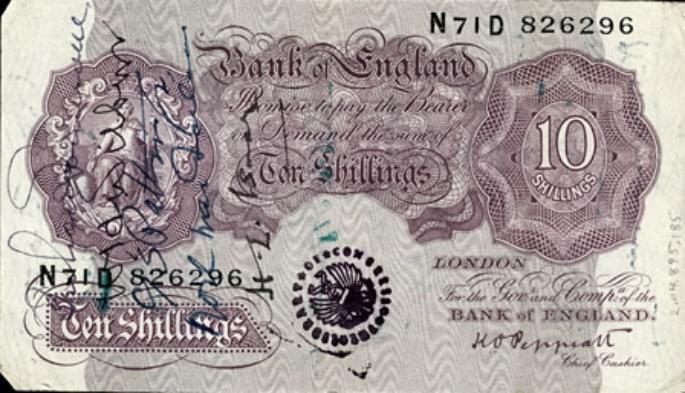 Here is a Short Snorter on a 1943 Ten Shilling note, with a date 19 August 1945 (checks date, a Sunday) written on the back. And what looks like 'Paris' written twice, before the date. 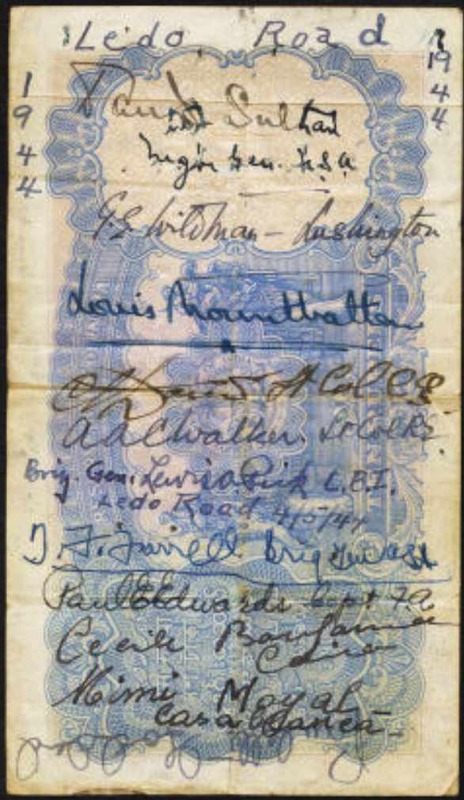 Most of the names are recognisable as Irish names, with the second from the bottom, O'Domhnall being written in an Irish writing style of the day—note the style of the D.
These may be servicemen of Irish origin in the British army, posted to Paris. 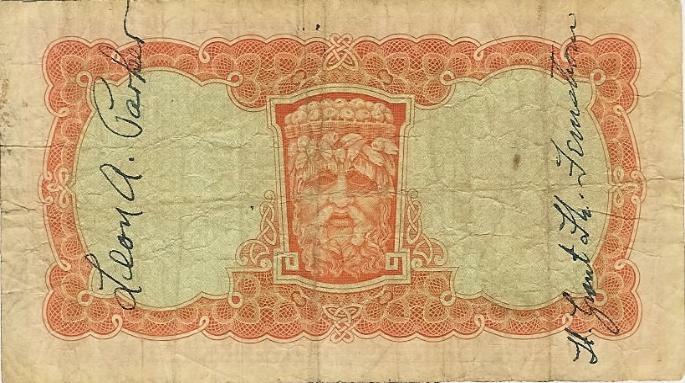 Here is a very dense Short Snorter on a 1942 Provincial Bank £1 note. 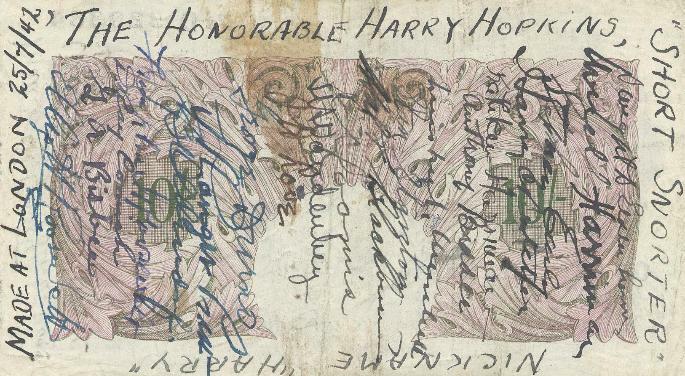 I can't see any date among the signatures which might indicate when the people signed the note. 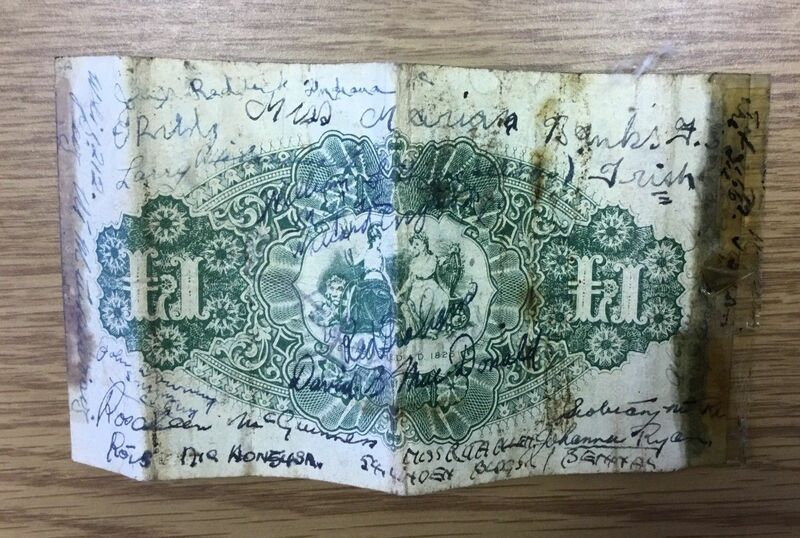 There appears to be signatures of Service personnel from a range of countries on it.